"Christoph Grund is a musician, who knows perfectly well how to give well known music the aura of the new and how to make the audience feel the trace of his intellectual tradition when performing the unknown. This is very rare. His very clear appearence and emotional intelligence supports the process of "understanding" music. As a result of his versatile artistic work as both composer and performer appears his unmistakable interpretation of music of the different eras" (Wolfgang Rihm). Mr. Grund has recorded piano music for all the major german radio stations and did also recordings for CD-productions. He does world premiers of contemporary music and performs at every major music festival around Europe. His repertoire includes key compositions by Beethoven, Schubert, Schönberg, Webern, Messiaen, Satie, Kagel, Boulez, Barraqué, Ives, Cage, Feldman, Ustwolskaja and Nono as well as very recent piano literature by Rolf Riehm, Wolfgang Rihm, Dietrich Eichmann, Wolfgang von Stuermer, Andreas Raseghi, Marko Ciciliani, Rebecca Saunders, Wolfgang von Schweinitz, Chris Newman, Iris ter Schiphorst, Herlmut Oehring, MArk Andre, Manos Tsangaris, Misato Mochizuki, Klaus Ospald, Georg Friedrich Haas. He is performing with formations like Ensemble 13, ensemble recherche, KNM Berlin, Ensemble Intégrales, Ensemble Oriol and Ensemble Phoenix, the Symphonic Orchestras of SWR, SR, MDR and the Deutsches Sinfonieorchester DSO, Berlin, under the direction of f.e. Leitner, Boulez, Gielen, Zender, Cambreling, Nagano, Metzmacher, Zagrosek, von Dohnanyi. He performs at numerous music festivals. („Salzburger Festspiele“, „Berliner Festwochen“, Wiener Festwochen“, „Festival d´Automne“, Paris) He is further active as a vocal accompanist and chamber musician partly in formations of his own. 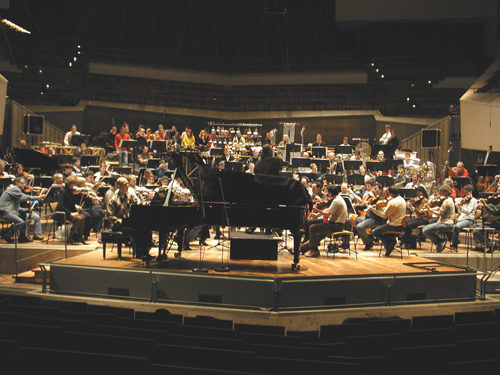 Most important stations of concert tours during the last seasons were the Carnegie Hall, New York, the Kioi Hall, Tokio, the Concertgebouw, Amsterdam, the „Berliner Philharmonie“, Palais des Beaux Arts, Bruxelles, the Louvre & Theatre du Chatelet, Paris, the Gewandthaus, Leipzig, the „Bayrische Staatsoper“, München, the „Zentrum für Kunst und Medientechnologie“ ZKM, Karlsruhe.